David DeGea (5.6) gets the nudge between the posts this week as he takes on Watford at Vicarage Road. He’s been in fine form racking up four successive clean sheets as well as saves to build up his points tally. Heurelho Gomes (4.7) has been retained from last week due to his impeccable form and cut price. The top keeper in the game is on the bench this week due to a tough fixture against the Red Devils. It might seem like Man United have a lack of firepower due to the recent injuries to Rooney and Martial, but we feel Van Gaal will make good use of his contingencies. Alexander Kolarov (6.2) makes it back into our lineup even though he’s up against Klopp’s Liverpool, but we’ve always been a fan of his attacking prowess and explosive runs down the line. He almost scored last Gameweek as well indicating how much of a threat he can be. Hector Bellerin (5.9) and Scott Dann (5.2) of Arsenal and Crystal Palace respectively have been chosen due to their favorable fixtures this week. Hector has been confirmed fit by the manager and we’re sure he’ll slot right back into that right back position like as if we was never away. Philipp Wollscheid (4.3) and Danny Simpson (4.0) provide good bench support for your main team without burning holes in your budget pockets. Aguero is back, we know. But these kind of injuries can take a toll on the player by forcing him to be cautious with his runs, which would be unlike his former self. 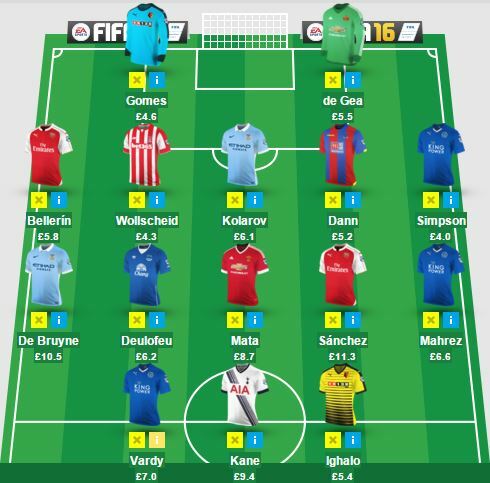 Hence we’re opting to stick with Kevin DeBruyne (10.7) as our only attacking player this week from Manchester City. Speaking of Manchester, a lot shall now rest on Juan Mata’s (8.7) talented shoulders, with their main strikers ruled out this week. We have faith that he will deliver against Watford, just as he did last gameweek. Alexis Sanchez (11.6) has an easy fixture against West Brom and will be raring to go and increase his goal tally, with Ozil’s help of course. But we have a feeling Alexis will get the better of Ozil this week. Leicester’s Riyadh Mahrez (6.7) has been scoring right from the first gameweek, and he didn’t stop on the International stage as well last week by shining for Algeria. With doubts being cast on Vardy’s fitness levels, Mahrez should do good on his increased responsibility if need be. Gerard Deulofeu (5.3) is a very gifted player who is in form and has contributed in the last 3 gameweeks. With Aston Villa as his opponent and everybody jumping on the Lukaku bandwagon, he could be a differential that could last for weeks due to Everton’s kind schedule. Jamie Vardy (7.4) . He’ll be having that record in his head for sure, but his fitness levels have been questioned by the manager, who said he won’t risk him if he’s not 100%. But knowing Jamie and his incredible work ethic, he will most definitely be on that field and gunning for Van Nistelrooy’s record. Harry Kane (9.4) has scored 5 goals and 7 bonus points in 3 weeks. He cannot go unnoticed anymore, especially against a travelling West Ham team that’s been weakened by the absence of their star creator. Odion Ighalo (5.5) has been a consistent performer, but with a tough opposition this week, could see him as a good bench option. This entry was posted in General, Squad and tagged english premier league, EPL, Fantasy Football, fantasy football squad, fantasy football tips, fantasy football transfers, fantasy premier league, football transfers, FPL, Gameweek 13, GW13, Transfer Tips. Bookmark the permalink.